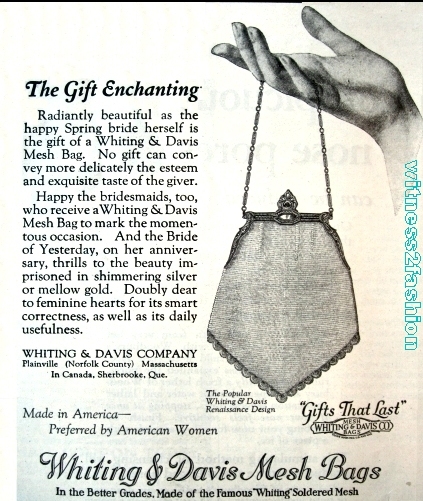 The number of surviving enameled mesh bags by Whiting and Davis amazes me, as does the variety of designs and vivid colors. No wonder they are collectors’ items! 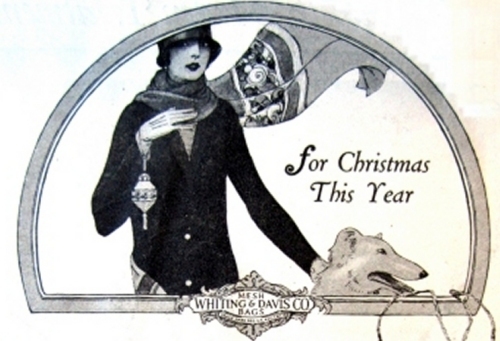 Two ads from The Delineator magazine, 1924, one a Christmas ad, and one from May, suggest giving Whiting and Davis bags as presents. 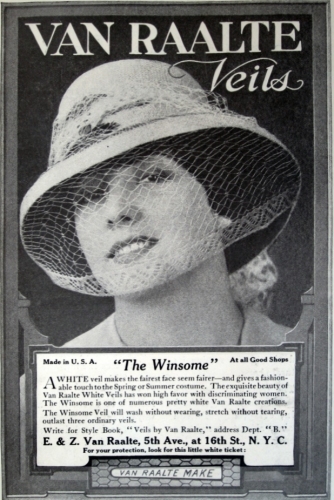 Those were the only months when Whiting and Davis ran ads in the magazine. That made me realize that most of these beautiful bags that have survived in perfect condition were probably gift items. And, at original prices from five to five hundred dollars, they were very nice gifts, indeed. 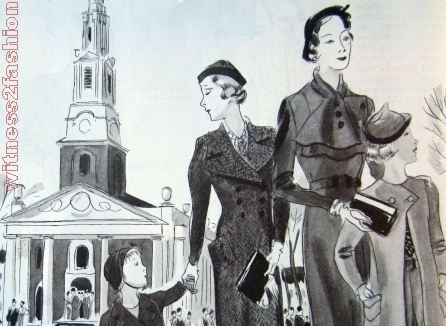 According to Farrell-Beck and Gau’s Uplift, p. 39, “Among women in clerical and business jobs, the annual median wage in the late 1920s was $1,548 [i.e., less than $30 per week.] 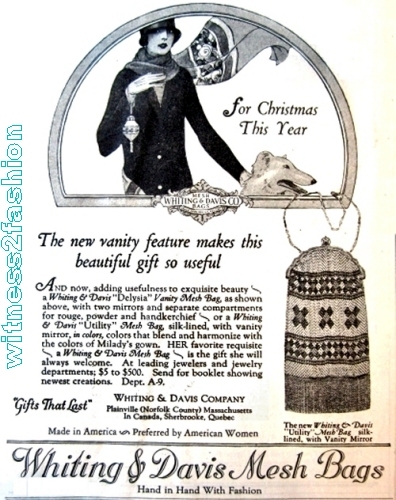 Weekly paychecks ranged from $6 for an office girl to $40 for a skilled bookkeeper.” Even a $5 evening bag was a luxury item for most women. 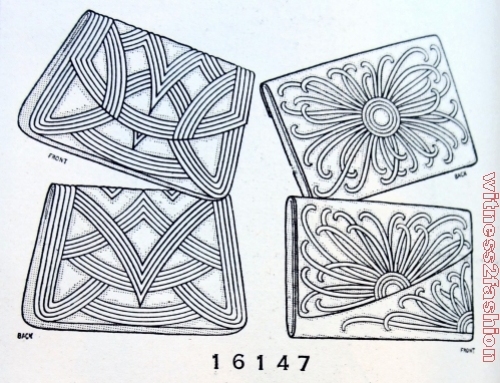 And, like many gifts, I suspect that a lot of the most spectacular enameled purses were rarely, if ever, used. It’s hard to coordinate a dazzling bag in elaborate patterns and colors with anything but a solid-colored dress, lovely as the bag may look in its gift box. 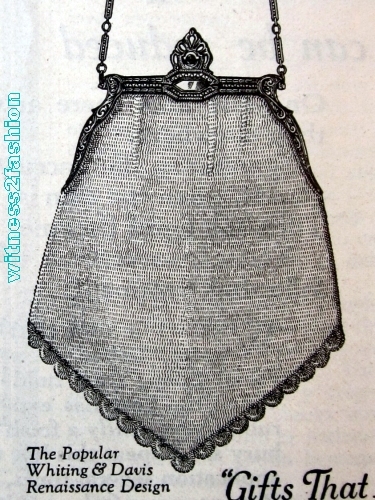 The Renaissance bag, of “Soldered Mesh” is the ‘chain mail’ type, not the flat, very shiny linked bags which are still made today. 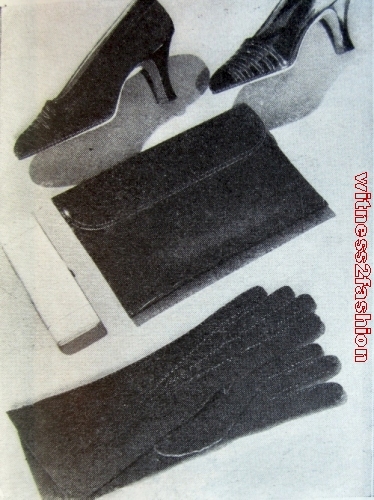 In his book Zipper, Robert Friedel explained that in 1923, handbag framers went on strike. 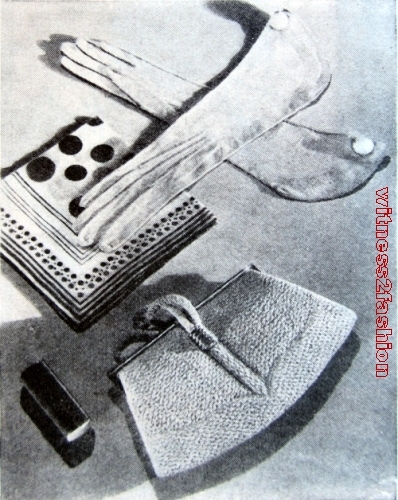 With normal handbag production stopped, the manufacturers realized that a purse that closed with a zipper could be made by a seamstress, and would not need a frame. 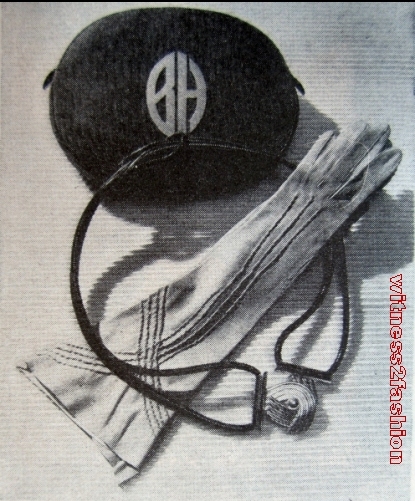 Men’s tobacco pouches already used zippers; a flat or fold-over purse was a logical development. 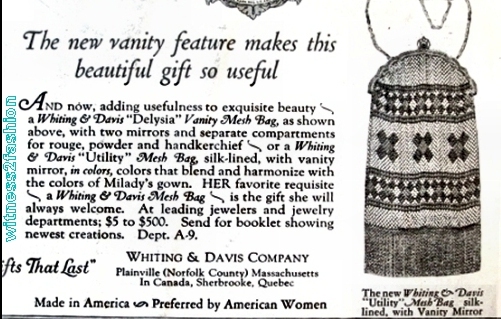 Indirectly, the 1923 framers’ strike led to the fashion for clutch purses in the 1930s. 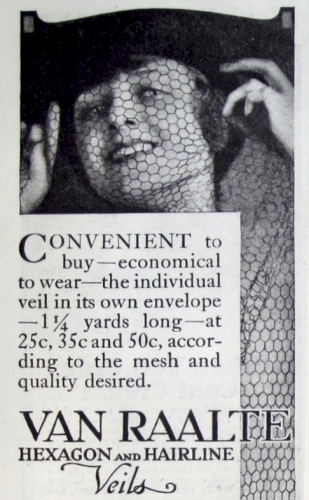 You could make your own quilted “Envelop” purses from a Butterick craft /embroidery transfer pattern, dated 1931. 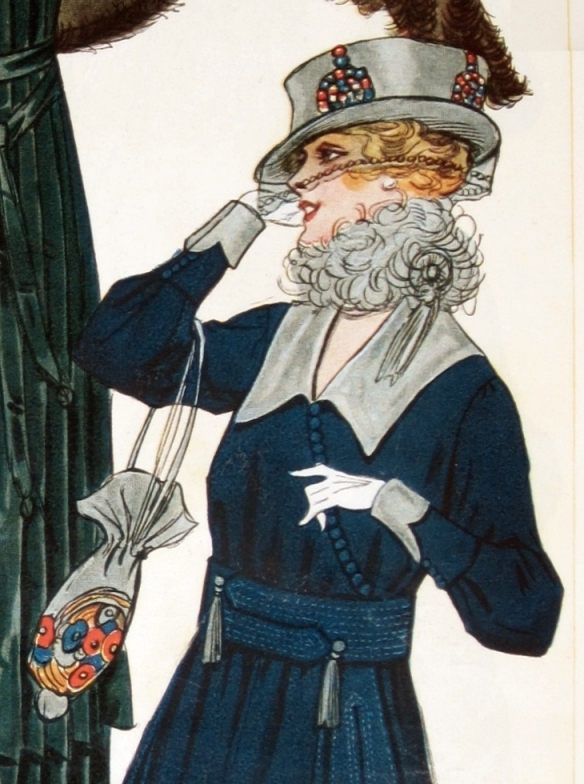 The fabrics recommended for these Art Deco bags are satin, flat crêpe, taffeta, or, for evening use, velvet. 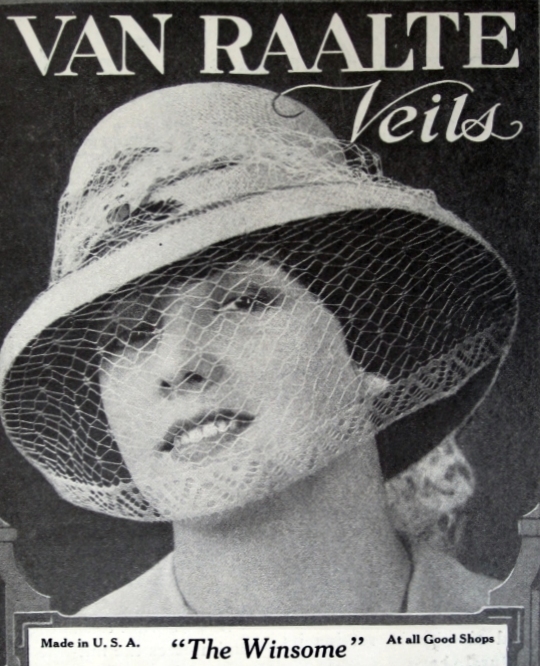 The pattern description doesn’t call for a zipper, but by 1931, according to Friedel, manufactured purses were using 35% of the nation’s zipper supply (p. 174). 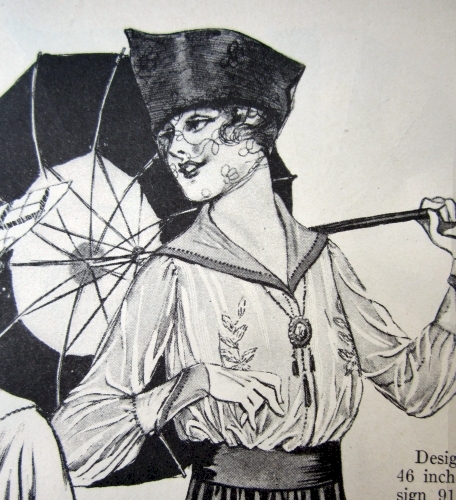 The Vintage Traveler has written on the Koret Company’s history and one of its later designers, Magda Makkay. 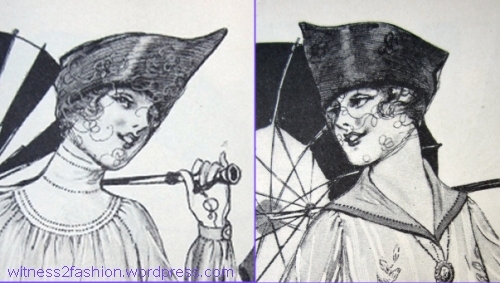 [Koret of California, a sportswear manufacturer, was not connected to the Koret purse company.] 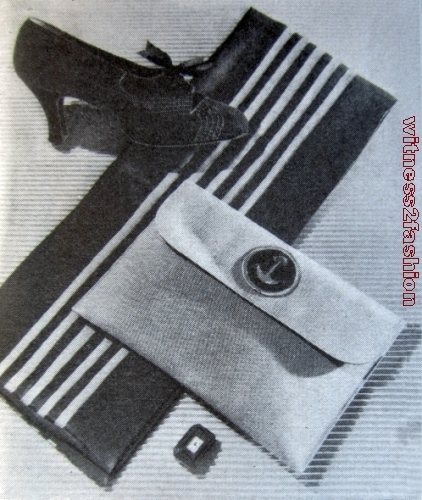 In a 1934 Delineator article about accessories for Spring, several Koret purses were featured. What Do You Call a Person Who Sews? That’s not the set-up for a joke. Whenever I see the word “sewer,” I have to read the whole sentence before I know whether it’s about stitching or drains. Tinker, Tailor, Sewer, Seamstress? Stitcher. But in the modern world, jobs are not usually gender related. 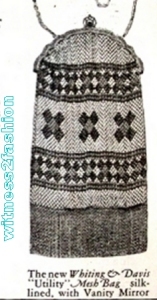 I have worked with female tailors and with men who sew dresses. None of us wants to be called a sewer – because in English, there are two ways to pronounce that word, and one of them has to do with plumbing. 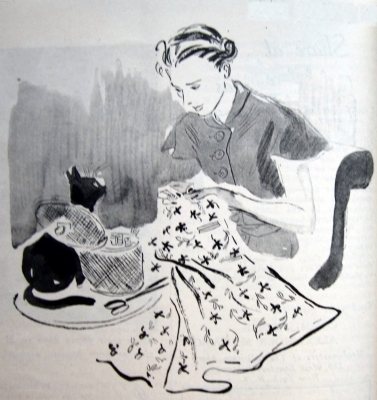 My last real job before retiring was as a stitcher. In professional costume shops, the job title for a person who mostly sews is “Stitcher.” I like that word; it’s gender neutral, and it’s accurate. Let’s hope it never applies to us! The Victoria and Albert Museum has an upcoming exhibition of Wedding Dresses. Opening on May 3, 2014 and lasting until March 15, 2015, the Victoria and Albert Museum will be exhibiting wedding dresses from 1775-2014, including couture gowns and royal wedding dresses. Thanks to The Para-Noir for writing about it. “O, to be in England, now that April’s there …” or coming, eventually…. 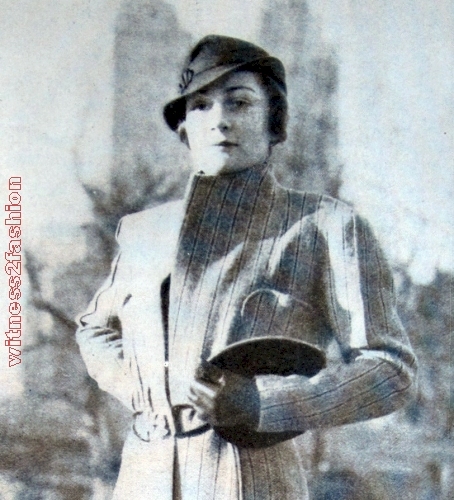 What-I-Found has been posting some marvelous winter clothing and accessories from a 1948 Sears catalog, including winter sweaters, gloves, purses, slippers, & children’s clothing — and a Mickey Mouse scarf. 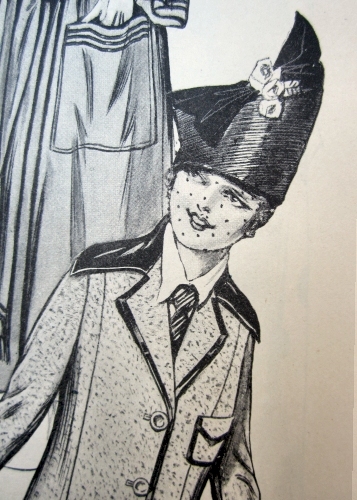 Earlier posts in December featured a 1934 child’s ski suit (about the same time I was posting a 1940 ski suit for women) and some classic children’s sweaters, including knitting instructions for a snowflake sweater, from 1955. Thanks to What-I-Found for sharing! 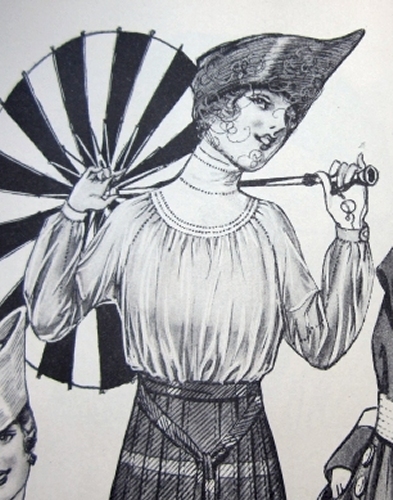 Serendipity at the library: While looking for something else in the fashion shelves, I found Uplift: The Bra in America, by Jane Farrell-Beck and Colleen Gau. [264 pages | 6 1/8 x 9 1/4 | 51 illus. Cloth 2001 | ISBN 978-0-8122-3643-9; Paper 2002 | ISBN 978-0-8122-1835-0 ] — University of Pennsylvania Press. Although it’s not a new book, it looks like a very informative and entertaining one, with lots of illustrations. And the text is searchable at this University of Pennsylvania Press site. 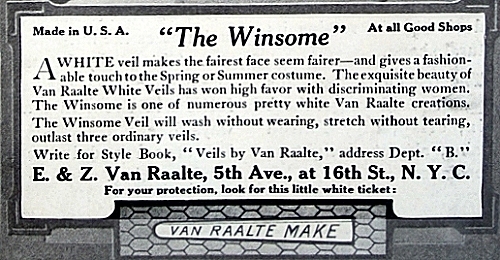 Just browsing through the book, I found an ad for Maiden Form, “The Original Uplift Bra,” dated November, 1927. 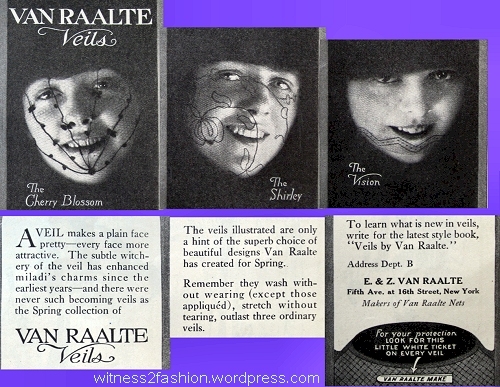 The authors also showed a 1943 ad for Bali bras, from Vogue magazine, with Cup Sizes A – B – C – D. And I learned that the underwire bra, “although offered by elite producers such as Vonny and Andre as early as 1934, … became common only after World War II” because the metal was needed for the war effort. If you want “the inside story” on brassieres in America, Uplift by Farrell-Beck & Gau might be just your cup … of tea. I found copies online for as little as one cent.